Natural England could learn a few lessons from the Forest Enterprise. I asked Forest Enterprise England for some information on correspondence between themselves and Defra on 21 November and received a reply on 29 November with no fuss at all. Thank you FC! You’ll notice that the email below has the subject line ‘Mark Avery’s blog’ which is probably because in the run-up to a Westminster Hall debate on lead ammunition, which was held on 8 December 2015, I published a number of posts on the subject – and it was at this time that Rob Sheldon’s e-petition was running. I guess it might have been the last one in particular which caught Defra’s attention. 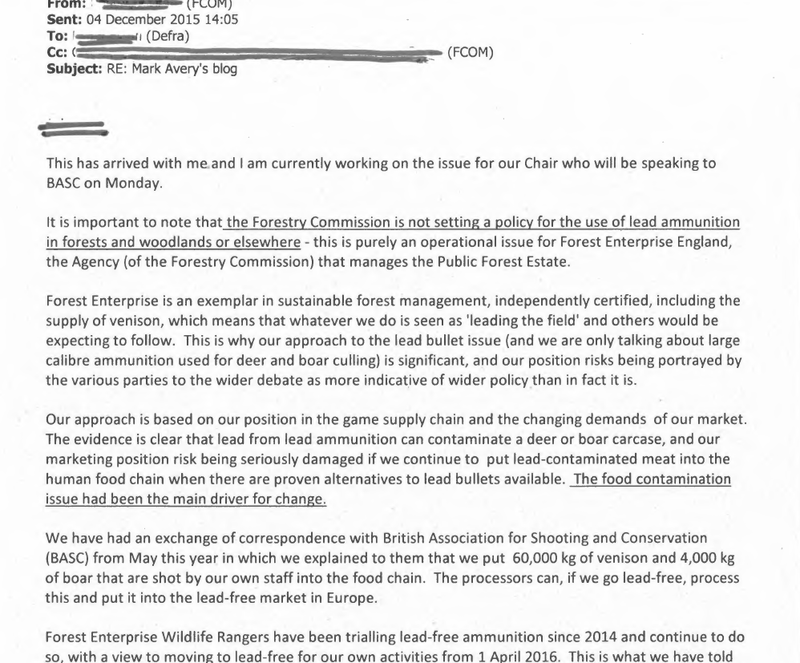 Forest Enterprise also sent me some other correspondence with Defra but I can’t find anything very interesting in it except this phrase in an email from Forest Enterprise to Defra, ‘Why would you put lead in food if there is an alternative, even if the impact on human health is still being disputed?‘ (see below). The Forest Enterprise briefing on the issue, with a note on what the minister George Eustice, standing in for his boss Liz Truss and his mate Rory Stewart (both of whom were in Cumbria splashing about in floods), said in the Westminster Hall debate on 8 December 2015, was also included – see below. 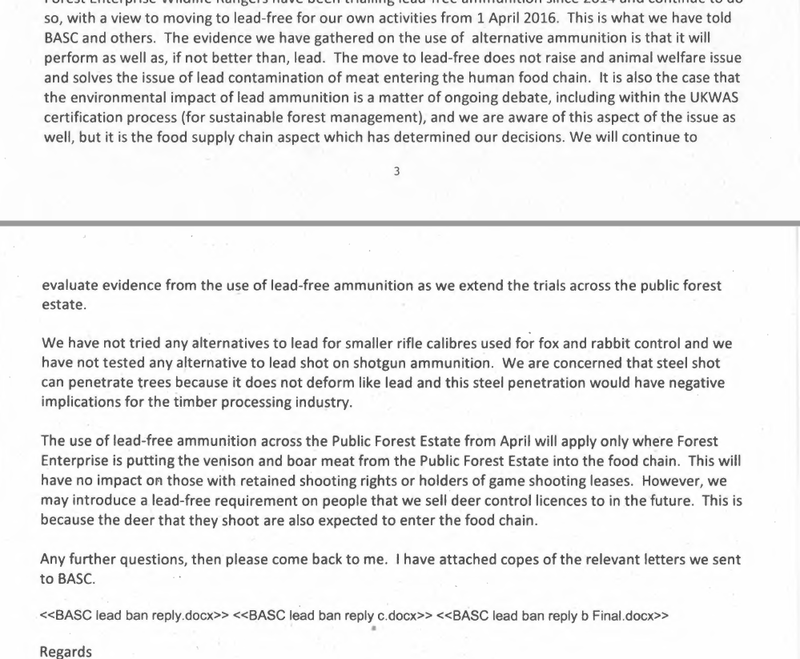 I wonder what Forest Enterprise said to BASC – I’ve asked to see that correspondence. I wonder what the Chair of Forest Enterprise said to BASC on Monday 7 December 2015 – I’ve asked for details. I wonder what the original Defra email was, subject ‘Mark Avery’s blog’, that started off this chain – I’ve asked to see it. 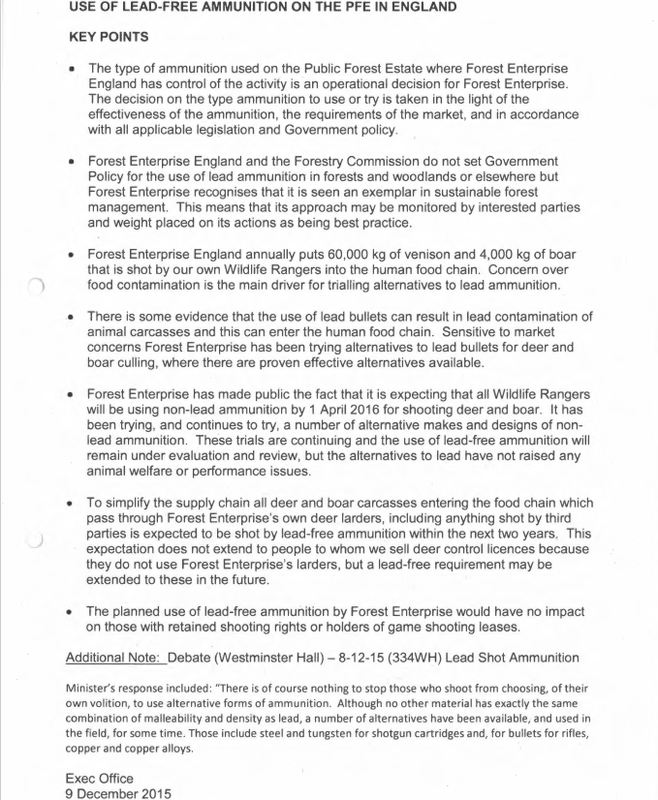 Forest Enterprise England has an admirable position on lead ammunition and food for human consumption. As a large supplier of venison and wild boar meat for human consumption it has noticed that there is evidence of high lead levels in such meat if shot with lead bullets which might well have human health issues that can easily be avoided by using other ammunition. They have tested non-toxic ammunition and found that they ‘have not raised any animal welfare or performance issues’. 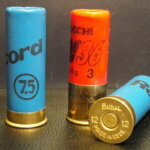 So they have switched away from toxic lead ammunition to non-toxic ammunition. That’s what more organisations should be doing and chefs, restaurants and game dealers should be asking for game meat to be supplied to them only shot with non-toxic ammunition. Excellent, sensible approach by Forest Enterprise. It's a real shame the Government cannot take a similar sensible, evidence-based approach and phase-out lead ammunition. They'd win plaudits for doing so. But that's the government we have - weak and unstable. Well done, Mark. You are clearly rattling cages! ...and why, were you a chef/food retail outlet, would you not want to promote lead free sourced game and be seen to have the customer’s best interests at heart? It’s a very condescending view of your customer to believe that they have no concern about the meat that they eat after various issues of recent years. I’m incredulous that they cannot see the PR benefits even if philosophically they are prepared to sell very low grade product to the public in order to make a fast buck! There again, by association, it’s what one might expect from much of the game shooting industry. Good to see that a major supplier of game really gets the issue. As they say themselves why would you use a toxin like lead when as good, if not better alternatives are available. I really do not undertsand the reluctance of the shooting industry to remove lead from the environment, especially without any detriment to their "sport".